Our product range includes a wide range of leafy washer, fruit washer and batch washer. Usage/Application Washing the various vegetables like tomato,green peas,cauliflower,corn,carrot etc. Vibratory unit consisting of SS frame, SS body, perforated screen, structure for mounting the vibratory motors, springs etc. Arrangement for spray of fresh water in the system is provided including pipeline & nozzles. 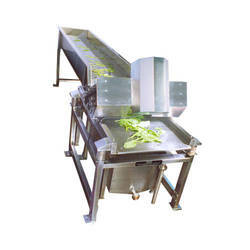 We are offering advance solution for vegetable and fruit washing. Presenting Fruit & Vegetable Washer for washing various fruits like mango, guava, apple and vegetables like potato, carrot, cucumber, beetroot, peas etc. Complete stainless steel body and supports. 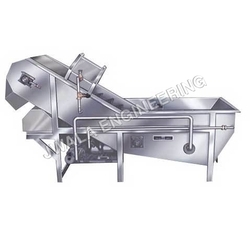 Specially designed takeoff conveyor to transfer the product from the washing tank to the discharge end. Sanitary design and ease in cleaning. Compact unit with a wide range of capacity. Suitable for washing all kinds of fruits and vegetables. Products like leafy vegetables can also be washed in the machine as the washing crates have spring loaded lids.